Our client from Buffalo, NY still remembers the day his dad’s hunting buddy pulled up to the driveway in a Land Cruiser - a 4x4 he’d never seen before. 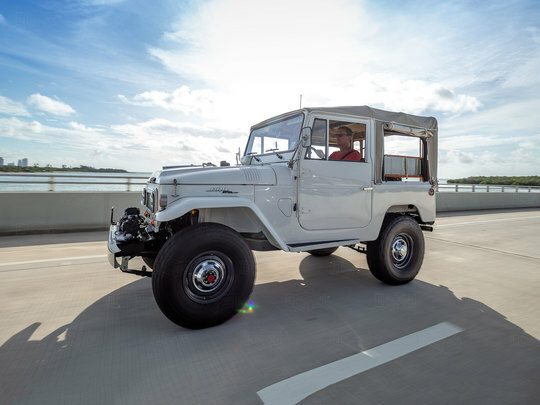 It made such an impression, that when he graduated from college in 1974, he bought a 1973 FJ40 soft top as soon as he could, “accessorized the heck out it,” and drove it for several years. Then, after owning a few different 4x4s, he decided to go back to the 4x4 of his youth. He purchased a 1968 FJ40 to drive on weekends, sold it in 2008, and began looking for another classic FJ40. His search brought him to The FJ Company — impressed by our craftsmanship, he decided to embark on a new project with us - a fully restored 1966 FJ40 that was customized to fit our client's vision of an off-road beast! How would our client describe his new rig? “Badass,” because damn it, he designed it that way. From the tread of its Nitto Mud Grappler® tires to its blacked out Method Grid wheels, to its fully operational Smittybuilt® winch, this rig doesn’t mince words. Its custom roll cage gives this FJ40 some serious backbone, and its removable doors dare you to remove them, just because you can. While our client admits that the big tires and off-road accessories were installed "just for looks," they hint at an underlying capability that lies within. Our client is a fan of the early Land Cruisers with their rounded front grilles, classic turn signals, and that gorgeous fin on the hood. And for that reason, the body sticks to the classic formula of the past, while the interior incorporates old school features like bench seats with Saddle vinyl upholstery, a period-correct steering wheel, and a custom retro shifter. This build is perfect for those seeking that classic Land Cruiser look, with added refinement and functionality. We began by upgrading this rig's suspension and steering systems. Then we installed a powertrain that complements this FJ40’s bold look: a Toyota 1FZ engine with programmable fuel injection paired with an automatic transmission. Put that all together and you get 210 horsepower - plenty of muscle for the daily commute, the occasional road trip, and everything in between. Additional creature comforts include LED headlights, a digital instrument cluster, simplified custom dash, and a vintage-looking radio with iPhone® and Bluetooth® connectivity. With a Toyota 1GR-FE engine and other modern upgrades, the G40 Expedition by The FJ Company is ready for the road ahead. Customize yours! Delivery in the Continental U.S.